Vol. 1, no. 1 (Jan. 23, 1901)-v. 23, no. 4 (Apr. 1923). Editor and proprietor: William Jennings Bryan. Issues for Feb. 21, 1902-1923 called also whole no. 57-768. Published in periodical format, Aug. 13, 1913-1923. Publisher varies: Charles W. Bryan. From the delivery of his 1896 "Cross of Gold" speech, a stirring plea for farmers and workers that insisted that the United States federal government make credit and money easier to obtain by coining silver, to his three presidential campaigns, William Jennings Bryan expressed an important political voice for the common person in the United States. During the final years of the nineteenth century and into the first decade of the twentieth, many Americans believed themselves victimized by banks, railroads, and agricultural implement dealers, who prevented farmers' economic progress. Coupled with sagging commodity prices, drought, high taxes, interest rates, and excessive freight charges, farmers and other Americans looked for assistance in their quandary.1 Bryan's philosophy and manifestos called for radical economic and political solutions to uplift farmers and workers, including a graduated income tax, railroad companies returning land to the public domain, the adoption of silver coinage with gold as a means of backing an inflationary money policy, and the direct election of senators.2 Eventually, Bryan introduced the reading public to his viewpoints and values through the press. Bryan had the idea of founding and managing his own paper since 1895. Bryan was no stranger to the tenets of running a major paper as he had served as the editor of the Omaha World-Herald in the two years prior to his first presidential run in 1896. He wanted to publish a national journal that would serve as a forum for reform, discussing issues of national and international concern. He also sought to make it available and within anyone's reach economically. Following his first two unsuccessful campaigns for the United States presidency, Bryan began publishing The Commoner out of Lincoln, Nebraska, on January 23, 1901 to take his message to the people through the most widely accessible medium for political expression available. 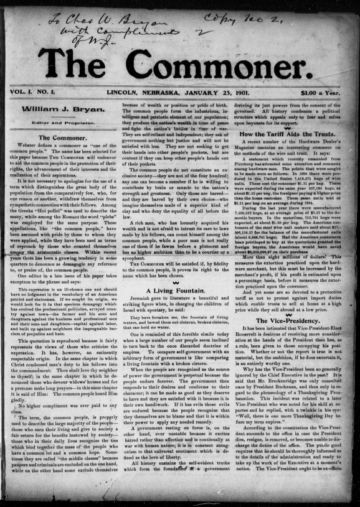 Contemporaries often called Bryan the voice and hope of the people, the orator of small-town America, and the mouthpiece for Jeffersonian Democracy, which he bolstered through the printing and distribution of The Commoner.3 Bryan published and edited The Commoner from 1901 to 1923. With a simple bold bubble letter masthead that seemed to epitomize the commoner theme, Bryan's paper espoused his personal, political, and moral agendas, including his domestic policy support for business regulation, citizens' ballot initiatives and referenda, and the political primary nomination system, and in foreign policy, an anti-imperialist stance. Issued weekly, the paper consisted of eight pages with three columns per page. As one of the more simplistic layouts of that newspaper era, the columns were clear and the writing concise, making it pleasing to the eye and highly readable. Bryan kept the paper in Lincoln despite William Randolph Hearst's suggestions to move the paper to New York or Washington for greater visibility. Bryan did so for emblematic and practical reasons. In 1913, the paper shifted to a monthly, 16-page layout to accommodate William Jennings Bryan's position as United States Secretary of State. Costs included $.05 for a single copy, $.60 for a half-year, and $1 per annum. At low prices, Bryan's paper brought his message into tens of thousands of homes, especially in the West and South and did so with the energy and zeal of his first campaign.7 While his messages did not specifically target Nebraskans, Bryan's politics and personality made Democrats and Populists a substantial force in the Cornhusker state, causing it to be a close battleground of politics throughout much of the last years of the nineteenth century and the first decades of the twentieth. Despite William Jennings Bryan and The Commoner's attacks on personal or political foes, the paper sought to unify the nation in support of the government during World War I. In the first wartime issue of The Commoner, the editors unambiguously declared that in wartime the President speaks for the country without division or dissension and that "the people are one. "11 In a later issue, the publication stated, "Patriotism requires some to give their lives; it requires some to give their money; it requires some to hold their peace rather than risk creating dissension or discord. "12 The Commoner understood and moved to make the American populace understand that unity remained the best course for the nation to take for a successful war effort and the possibility for peace. As secretary of state and after his resignation, Bryan promoted peace throughout the world in the form of a League of Nations. In April 1919, as the war drew nearer to its end and the specter of peace grew, Bryan published his thoughts on the League of Nations. He called its proposal, which he described as a combination of thirty arbitration treaties negotiated by the United States with other nations while he served as secretary of state, "the greatest step toward peace in a thousand years. "13 Bryan and The Commoner maintained a genuine excitement about the possibilities of world peace as they advocated the ratification of the League of Nations rather than an Anglo-French-American alliance, which he believed would eventually lead to future wars. Bryan continually sought governmental regulation of industry in the interests of the common people, checking business titans and competitive individualism as well as opposing railroads. The editor advocated greater self-government by the people, moving away from bossism and governmental corruption. During World War I, The Commoner detailed the federal government's successful management of the country's railroad systems as "a final and conclusive argument in favor of government ownership. "14 One editorial noted, "While the President's authority over the railroads is a war power and will terminate with the end of the war, the lessons learned are not likely to be forgotten. "15 Such lessons, the paper suggested, could secure the maximum advantage from public ownership with a minimum of risk, particularly in industries like the telephone and railroad. The Commoner outlined a plan for public ownership of the railroads that would mean for the common people of America economic advantages by removing the industry's price gouging on transporting people and goods. It also meant the end of resistance by railroad managers to efforts at effective legislation, and no more shielding of railroads from needed supervision. Towards the end of The Commoner's run, the paper began taking on the evolutionary theory phenomenon. In June 1921, the paper first addressed Darwinism and the teaching of evolutionary theory.22 When taken seriously, Bryan said of Darwinism that it caused people not to believe in Jesus Christ and to call him and his attributes myth. Such thoughts, the paper wrote, proved a menace to belief in God and to Christian religion. One editorial stated, "If all the teachers of evolution who agree with my correspondent would be as he, it would not take long to separate them from the salaries paid them by Christian taxpayers. "23 The paper used its pages to rail against policy enabling the teaching of evolutionary theory and steadfastly opposed such thinking in public. After 768 issues, in April 1923, Bryan ceased publication as he had lost esteem amongst his national Democratic colleagues and his brother, Charles, had become Nebraska governor and could no longer devote his great effort to the paper. The Commoner had gained a national readership and held much political influence. William Jennings Bryan's opinions and thoughts mattered to many people, and his paper's content highlighted some of the most crucial events, policies, and debates concerning early twentieth-century national and international politics and diplomacy. History Nebraska houses an entire run of this publication on microfilm. 1 Donald R. Hickey, Susan A. Wunder and John R. Wunder, Nebraska Moments (Lincoln: University of Nebraska Press, 2007), 135. 2 Hickey, Wunder & Wunder, Nebraska Moments, 136. 3 LeRoy Ashby, William Jennings Bryan: Champion of Democracy (Boston: Twayne Publishers, 1987), 105. 4 Larry Osnes, "Charles Bryan, His Brother's Keeper," Nebraska History 48 (Spring 1967): 57-59; Nebraska Democrat, January 1942; David A. Anderson, William Jennings Bryan (Boston: Twayne Publishers, 1981), 122. 5 Robert W. Cherny, A Righteous Cause: The Life of William Jennings Bryan (Boston: Little, Brown and Company, 1986), 97. 6 Anderson, William Jennings Bryan, 124. 7 Lawrence W. Levine, Defender of the Faith: William Jennings Bryan: The Last Decade, 1915-1925 (New York: Oxford University Press, 1965), 23. 8 Donald K. Springen, William Jennings Bryan: Orator of Small-Town America (New York: Greenwood Press, 1991), 60. 9 Cherny, A Righteous Cause: The Life of William Jennings Bryan, 124. 10 Hickey, Wunder & Wunder, Nebraska Moments, 142. 11 "At War," The Commoner, April 1917. 12 The Commoner, October 1917. 13 The Commoner, April 1919. 14 The Commoner, December 1918. 15 The Commoner, December 1918. 16 Springen, William Jennings Bryan: Orator of Small-Town America, 30. 17 Cherny, A Righteous Cause: The Life of William Jennings Bryan, 203. 18 Springen, William Jennings Bryan: Orator of Small-Town America, 30. 19 Levine, Defender of the Faith, 116. 20 The Commoner, May 1916. 21 "Prohibition and the Farmer," The Commoner, September 1917. 22 "The Modern Arena," The Commoner, June 1921. 23 The Commoner, July 1921.